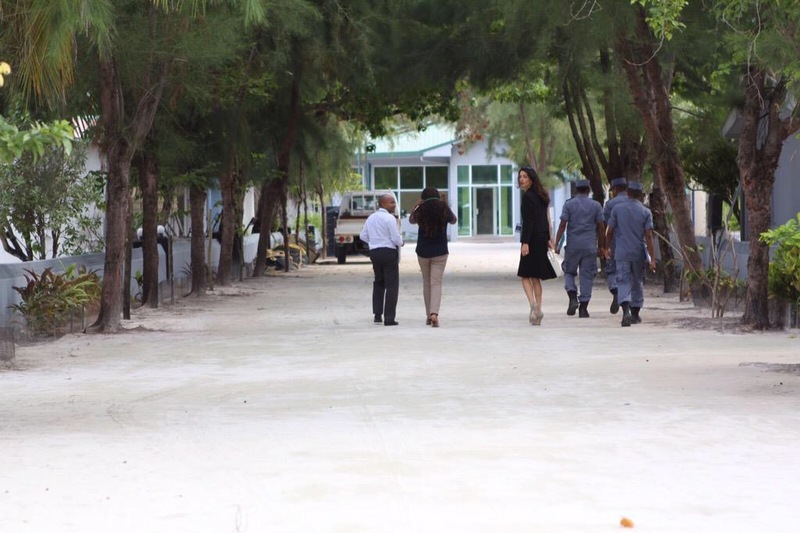 Amal Clooney visited former President Mohamed Nasheed today for the first time at the high-security Maafushi prison. “He’s pleased that I’ll be attending meetings on his behalf with the government this week,” she said. President’s office spokesperson Ibrahim Muaz Ali said in a tweet today that Attorney General Mohamed Anil will meet Nasheed’s foreign lawyers on behalf of the government. Amal looks great! Professional and polished. Right for the occasion. I think this outfit would be perfect for a court appearance in Manhattan or London, but doesn’t translate to meet a client in the Maldives. Also at 37, you should know how to cross your legs without flashing so much thigh or feel the need to display the latest designer bag so ostentatiously in front of your client’s wife. For tips on how to get out of a car or sit on a chair – no-one did it more elegantly than the late Princess Diana. Love love love what shes wearing!!! So work appropriayte. Now stop tossing ur hair and be commamdinh and ull make such a professional impact! Love it!! I think the same , Nati! I think she looks perfect. She is somebody very sure of herself, no doubt about it. Love the hair, so natural. And also loved her hemline. Go, Amal, you know how to do it! I think You’re right Nati. Amal should be grateful to you for this blog. She gets to see feedback and readjust accordingly! Daniela , funny , I had a dream with Amal in it a few weeks ago too! We were friends in the dream and she seemed so nice and down to earth. You just might be right Nati, or someone is! Often it’s a coincidence, as if someone IS reading AND advising. 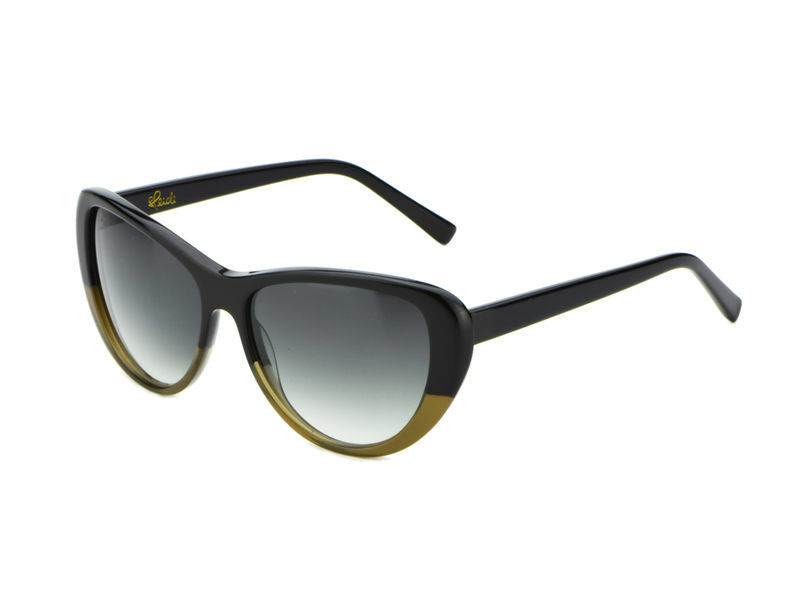 The sunglasses Amal’s wearing with this black suit are by Heidi London – They are the classic cateye black olive ones. Nati any idea what fitness program Amal does? A figure like that would require a combination of aerobic and non-aerobic exercise with a diet low in fat and high in protein to maintain lean muscle mass. It’s not easily attainable – it requires good genes (eg height, no pear shaped hips etc) and then the discipline and dedication to an exercise regime that is in line with being a model or semi- professional athlete – with professional assistance (personal trainer, dietitian etc) – along with a very strict caloric intake. On that note, I’d like to remind the ladies here that she doesn’t cook, clean, iron, wash, garden, sew, raise kids…and money is not an issue. It is not easily replicable in the ‘real world’. There is a concern in fitness circles about women trying to emulate what is not realistically attainable by most women. I wouldn’t be surprised if she has a sub-threshold eating disorder. I say this as she appears very body image conscious and seems a perfectionist. We see professional women like this all the time. Going by her appearance in some recent clothing, no muscle group has been overlooked in her fitness regime. She works very hard in the gym – especially (it appears to me) on her legs – in short, it takes a controlled caloric intake, strict daily exercise regime (weight bearing and aerobic exercise), enormous self discipline and a dedicated team to look that good. I REALLY doubt she is that obssessed with her body….one can easily see that on her misses and faux pas… She was that skinny before she married George, look at some pictures (the one she wears a blue pants and white little top) she was already that way. I see no difference. That is her body type, her genes, many are like that, they can eat a load and dont gain weight, it does not mean they are sick. One way that proves Amal is not an out of normal perfectionist, is the way she carries her sunglasses over her head. If she was that much obssed with fashion and hiting it right always, she would not do that, because fashion “gurus” would qualify that as such a no no. And there are many other little misses that proves that. Even though she loves fashion and loves dressing up, she is not wasting huge amounts of time in front of the mirror analizing herself. She comes across to me as very self confident in her apearance/body, even though some point out all her flows. We all have them and she seems to not care at all and not live her life lamenting on them. She is who she is and she embraces it. That is what i perceive from her. Her hair is looking very ratty, she should sort out her extensions better. I guess this black color on repeat will feed well the ones who criticised Amal for her white and red atire colors in Egypt.. BLACK IS IN THE MENU!! 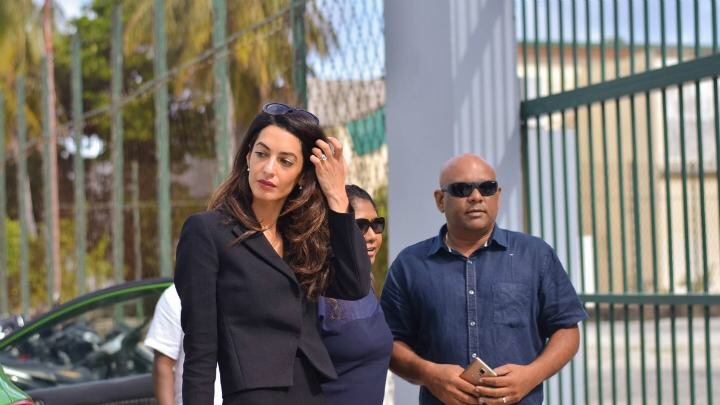 🙂 I am not always fan of all black… but it seems there is a hidden statement here give the REAL risks she is taking on this trip and mission, and her colleague being stabbed in being at hospital ( Maldives lawyer representing Nasheed in Maldives). But it is hard to deny how well she wears this suit and how tall and elegant she looks. Go Amal! But i promised that if she threw away this bag near my garbage can i would not pick it up 😦 …dont like this bag. But one could argue that it would also be apropiate to be fair… there are hundreds of pictures taken of her, form uncontrolable angles and yet, only one is …showing….what exactly? i cant really see “it”.. can you? It must be impossible for her to control all angles. Maybe if she posed her hand there just before she felt (with her 7th sense) that there was going to be a picture taken from below… would reduce minds insinuations, but nothing is really exposed. She is very classy, so one little miss like that is not going to overwelm all the other moments where the pictures are angled right. The glass must be looked as half full! Soos, but she does!! Give her a break ! SOOOOO many pictures and only one has a little issue…. and not really…. she is only human!! Can you imagine what is going in her mind at that moment? I bet if you were in her position, or any of us, at least one pituire would come out less “appropiate” . Why not focus on the other hundreds of pictures? why focus on only one when you must know that it was not intentional, it is not who she is, she is not a vulgar, non classy woman in her nature! Why cant you give her a break on that? Same for the tequila dress…. I would bet my head that she had no idea that such dress was going to expose her undies when flashed under supwer high megawatts flahs lights. THE DESIGNER of that badly cut dress should had been the one to have tested his fabric under such lights, (to justify his nonsense high price for such badly designed dress on the first place). I doubt she had any clue of it. And i am sure you are already going to say that she should not wear such short dress on the first place.. well.. for that i will say… she is not you, or me, she is herself and she can do as however pleases her. She looks great in it, she has a great body, is confortable on her skin, and all..and etc.. so it is best to stop comparing her to you or to anyone else. People are not the same! She has never promised to you or to anyone that she will be or behave in a way to please all, because she must know that that is impossible! There are so many who are praising her for who she is and her looks, so why do you think she will focus on the ones who are so easily to criticise, to put down, to dismiss? I would not and i am sure she isn’t either! I am afraid, I cannot possibly agree with any of the above comments. The outfit is surely nice BUT utterly inappropriate for this occasion. First, the shoes. It is common knowledge that literally everywhere at the Maledives there are sandy roads and sidewalks. High heels therefore unpractical for stepping in and out of boats and walking on sand. Second, the bag! This flashy designer bag in creme is surely nice for a city trip BUT not suitable for a business occasion. She should rather have opted for an elegant and modest briefcase in a quiet color. Third, the sunglasses on top of her hair. There may be the necessity to wear them in bright sunlight, nothing wrong with that BUT as soon as they leave the face they should come off completely. For business there is no place for them to function as a hair band substitute. Last but not least – the constant hair tossing. She should really work hard to get rid of this appalling Barbie attitude. By the way, I am not the only one of this perception. Many European life style magazines commented in an almost similar way even on television. Now this is what I expected her to wear in Egypt! Someone must have given her feedback! I wonder if it was even George who said something?! Being in film, he must know better than anyone the importance of a “costume” and the message it will convey. Anyhow, she looks great though the shoes don’t look the most comfortable! I had to laugh at the pic of her in the plastic chair in the prison….she is so glamorous but in the most unglamorous surroundings. At first she had her bag on the chair next to her but then it got forced to the floor…that poor cream bag on a dirty floor! I can’t believe how tall she is as well. Love the sunglasses. She always picks pairs that suit her face shape perfectly! Wonder if she has a marketing agreement with that shoe company? I don’t get the formal business dress; it’s like Amal is planning to be photographed. Not that she should dress unprofessionally, but does consultation with an incarcerated client require dressing up to this extent? The clothes seem so out of place; they leave the impression that her being there is more about fashion than it is about justice. She’s wearing the $700,000 engagement ring, while she whines on and on about human rights in a country where the average worker earns $250 a month! When one enters such a poor country fighting for human rights, one should be more sensitive to the surroundings and poverty-stricken people and down play designer duds and expensive jewelry! Angelina Jolie is a prime example of less is more when visiting such poor countries!!! Nati, I know that you and most of the others who visit your blog only want to praise Amal Clooney and absolutely refuse to hear anything negative about her. 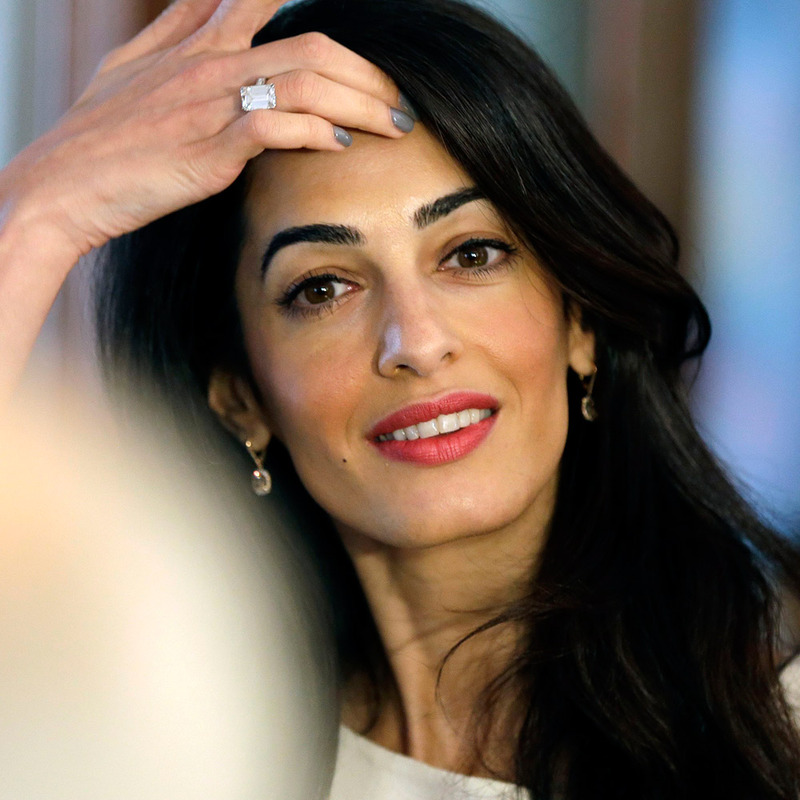 Anyone who does not worship at the Church of Amal Clooney is called a “hater” and you deny that person the opportunity to post a comment in your blog. I do not hate anyone, including Amal. I do not understand how anyone can turn blind eyes to how she conducts herself. 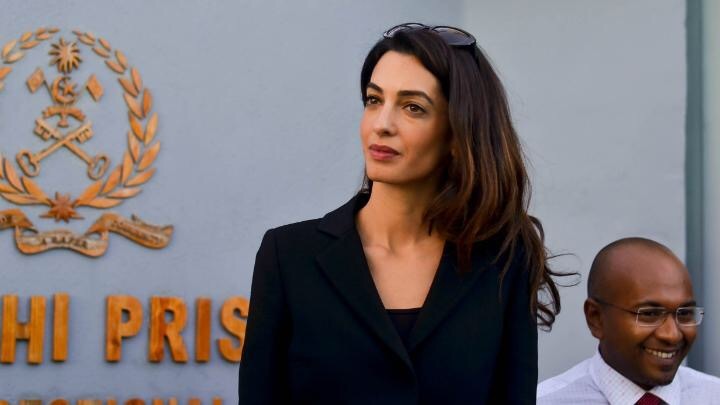 Amal is prancing around in super expensive designer clothes, and she is firmly focused on the location of the nearest cameras rather than her client. She’ll be gone in a couple of days having achieved her goal of more publicity for herself while her client rots in jail! To me, this is simply amazing conduct in anyone, but especially in a human rights barrister!!! I love your comment, my thoughts exactly! Not all people are big fans of her because of her and only her ,the way she presented her self . Maha, you are making me so happy about myself:) Thank you! One thing is to criticise, the other is to only see negative points. It is quite easy to see a hater form a genuine commentator: there is balance. You and Anna seem to have this idea that i idolise Amal, that she is my role model. As a matter of fact i idolise nobody! She is not a role model to me since i am not looking for a role model. My role model is myself, and i make sure i do better each day i am given another chance to live. But the difference between me and you Maha and Anna, is that, if i felt this much negativity coming from Lady Amal as you seem to feel, i would not be here, not even a second! It makes no sense to me that anyone is so little of a fan of a person, and yet, spends this much time around their world, and most of the time to just point out her flaws to others. I would, most ceretainly, spend such precious time around the blogs of the people i admire, bringgin them my positivity. Dont you think that is a much better choice to contribute to? I am not here to defend her, i am not her lawyer. What i defend is my own views form comments that are unfair, are based on untruthful assumptions, are geared torwards creating a negative profile about Amal without real grounds. Anyone trying to do that constanly, comes across as devious to me. Why spend this much time around someone they dont care for as much or admire as much? Why not leave Amal alone to her sort? If you are right about your assumtions about her character, dont worry, In the end, only her will have to respond for her actions and live out the consequences of her choices. Brenda, I agree with your thoughts. You raise an interesting issue about wearing expensive jewellery to a second/third world country and leaving sunglasses on one’s head when in a professional capacity. It is in these small but significant gestures that there sometimes seems to be a disconnect with reality, purpose and professional capacity. Whilst I am no fan of Angelina Jolie, she does do the advocacy and publicity thing better and deliberately refrains from designer clothing, shoes, bags and jewellery depending on what the occasion calls for. It was disconcerting to hear George chat about her work on national television. He really needs to stop doing that. By romanticising and speaking so nonchalantly and glibly about the work Amal does, he brings his wife down and makes them both look like fools in not being able to separate Hollywood from the real trials and tribulations of others. Anna, my lover:) I do agree with you about George needing to stop commenting on Amal’s work. Not sure if you saw it, but he did adjusted to his unfortunate comment on the TV show.. he has since then stated that she is a grown woman and has her own career. I do wish he would just stop commenting on her work. @Jaclyn: You may be aware that people of Indian heritage are very short and tiny. So it is not, that Ms Clooney is statuesque, she stands out because everyone else is shorter. When she is pictured with people from Europe she I average height for a woman. @Minnow: I wonder why you would be interested in her fitness program. She is neither toned nor does she look very sporty. She does certainly not give the impression of a person who does a lot of sports. She is thin, that’s all there is. Have you ever noticed her upper arms? A little weight lift here and there would help a lot. I suspect that she is so thin because she doesn’t eat as much as she should, not because she exercises that much. When you look at older photos of her – during her Julian Assange case years and until she met George – she has a little more meat on her bones, and it makes her look more vibrant and healthier. Now, she looks “model thin,” not athletic, and her face looks very gaunt. I know what runway models eat (I had a friend who was a runway model for a well-known Italian designer back in the 1990’s), and it’s really not much, not to mention not good for long-term health. I’m guessing that her diet is like theirs. Also, she could be hyperthyroid. Wish she had worn this outfit in Egypt – it’s classy, stylish, professional, respectful and demure. DISLIKE: Wear pantyhose – pleeeeaase! It’s really disgusting and unprofessional. You are not on holidays. Less make up please. It looks caked on. She is saying : it wasn’t s mistake this is what truly I am. Nati, I know that you and most of the others who visit your blog only want to praise Amal Clooney and absolutely refuse to hear anything negative about her. Anyone who does not worship at the Church of Amal Clooney is called a “hater” and you deny that person the opportunity to post a comment in your blog. I do not hate anyone, including Amal. I do not understand how anyone can turn blind eyes to how she conducts herself. Amal is prancing around in super expensive designer clothes, and she is firmly focused on the location of the nearest cameras rather than on her client and his predicament! 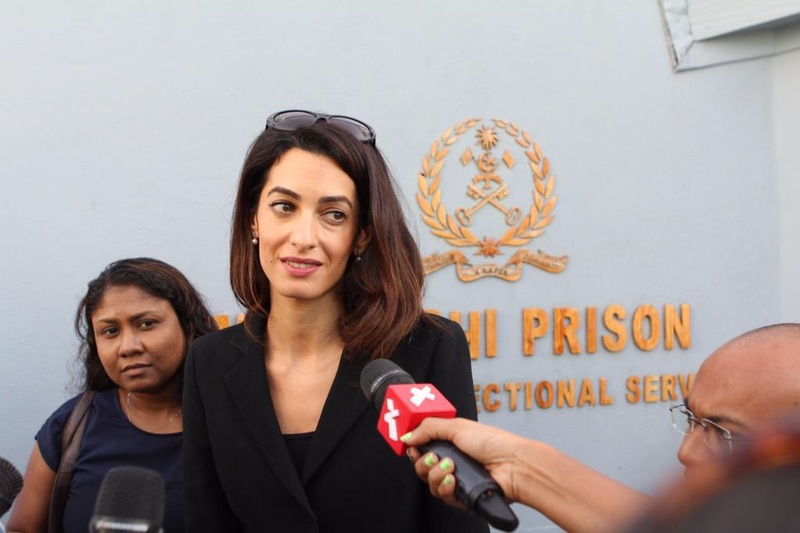 Amal will be gone in a couple of days having achieved her goal of more publicity for herself, while her client rots in jail! To me, this is simply amazing conduct in anyone, but especially in an international human rights barrister!!! Amal looks wonderful, from head to toe, even in these very simple and less glamorous clothes she oozes glamorous, she is a feast for the eye, having this “je ne sais quoi”, beautiful as ever …Thanks to Nati for the many beautiful pictures! BUT … I think all of that could be a problem for Amal´s professional career: looking always like a model, looking always perfect in all pictures, always wearing beautiful and expensive clothes, her pictures looking like Vogue adverts. Amal is dressed professionally at first glance, but the shoes, the sunglasses, her hair (plus tossing, flipping and touching it), her way to smile, to look at the cameras, to stand, to walk – all this is exuding an aura of luxury and the impression she modeling expensive clothes for fashion magazines. In other words: she is not credible as barrister, she looks like an actress or model playing a barrister in a movie or fashion magazine advert. Watch the videos and pictures (google,youtube) of her friend and colleague Jennifer Robinson, an outstanding barrister, also watch the speeches of Dinah Rose QC, one of the best barrister in UK! Both women are good looking and elegantly dressed … but one does not have any doubt that these women are very professional and to be taken seriously as barrister! My comment is meant as an observation – not a critic. I would like to get feedback, especially (but not only) from UK barrister or from other countries – what impression do you have? Agree with your observations Kala. Amal looks wonderful, from head to toe, even in these very simple and less glamorous clothes she oozes glamour, she is a feast for the eye, having this “je ne sais quoi”, beautiful as ever …Thanks to Nati for the many beautiful pictures! BUT … I think all of that could be a problem for Amal´s professional career: looking always like a model, looking always perfect in all pictures, always wearing beautiful and expensive clothes, her pictures looking like Vogue adverts. Amal is dressed professionally at first glance, but the shoes, the sunglasses, her hair (plus tossing, flipping and touching it), her way to smile, to look at the cameras, to stand, to walk – all this is exuding an aura of luxury and the impression she modeling expensive clothes for fashion magazines. In other words: she is not really credible as barrister, she looks like an actress or model playing a barrister in a movie or fashion magazine advert. Watch the videos and pictures (google, youtube) of her friend Jennifer Robinson, an outstanding barrister, also watch the speeches of Dinah Rose QC, one of the best barrister in UK! Both women are good looking and elegantly dressed … but one does not have any doubt that these women are very professional and to be taken seriously as barrister! This is my sentiment exactly!! I dont mean to criticize her as one career gal to another but i just cannot take her seriously. I have friends who are in law school and speak with more command than she does. And as much as i am a feminist and believe women can br feminine pretty and professional, she always seems to go for the pretty and glamorous even at inappropriate times. If she would tone down the modelling hair tossing and giggling id feel differently and believe me when i say i am rooting for her but everytime im impressed with her tiny attempt at professionalism ie this suit she shows up in a red fitted dress high heels and a shoe and i sigh a deep sigh of disappointment. Perfect look for Amal – Elegant, professional and classy…and yes I’m sure she does follow your blog Nati whenever she can! Any ID of her pretty handbag? For the ivory handbag, my first impression was LV. Has anyone noticed she lightened her hair a bit, AND, got some highlights? 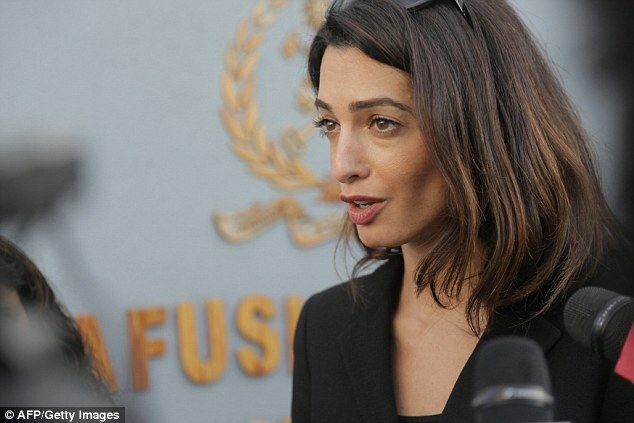 Less make-up here, is so much better than her Court appearance in Egypt with rasberry lipstick. May I add: stilettos are out of place. Lower heels are more discreet therefore more appropriate considering jailed clients. And if she has to step over from a boat ! And last, what’s this pic in front of the prison, all smiles?? Out of situation too. Please, we like Amal, we know she likes to look perfect, we do too, but when at work, tone it down ! Again we see more designer clothes, a Gucci bag another pair of stilettos, different sunglasses, more hair touching and tossing and smiles for the cameras. How many different outfits plus handbags plus shoes are required for a two day business trip? Honestly, the more I see about her the more boring it gets. She clearly is on a mission. Only this mission seems to be serving nobody but herself. I really wonder for how long the media will keep commenting on her selfcentered and shallow “wanna be a barrister show” before they get bored enough to stop. For the serious journals she has always only been worth a line or two. Should Ms Clooney have serious and honest intentions to be playing in the same league as her professional barrister colleagues or some real human rights activists she still has a long and dire way to go and she is nowhere near as of to date. From what we have seen so far, I actually doubt that she will ever be capable to come close, let alone to reach those standards. She should be very careful in order not to drift even more towards the junior barrister turned fashionista direction than she already has. She is a brain and she loves fashion. You don’t know her so it would be better if you don’t judge her to hard about her appareance. Nati, in the same vein, you don’t know her either – none of us do – so Lara *may* actually be right. The fact that Amal gives cause for people to think this way indicates something is amiss, no? Anna, haters are not “people” who think with the same reasoning as good people do. Haters will hate and will find wrong with everything. For someone to come here and just write negative stuff, and seems so obviously in disaprove of all that Amal is or do, it can ONLY be a hater of her… I am very curious why do you come here to bahs her so much and support anyone wh bashes her… what is your agenda?? Not everyone is that devious on their thinking. Haters are such a bore!! Grow up and feel good about yourselves and you will maybe see the world with a lighter color! Hey Lara, it not because you chose to wear the same clothing every day that Amal has to! This was a 4 day event, each a different situation, place, different day, it is perfectly normal for anyone to change clothing each day. I am sure most barristers or professionals who do not wear an uniform for work, do not go to work with the same clothing each day. I am sure that if you had hundreds of shots taken on you, there would be a few in which you would be touching your head, nose, hair, or doing some typical of humans to do. ai ai ai the kind of nonsense comments, seriously,,, bring something that makes a case against her because this “hair tossing” stuff is not doing it. These are pictures folks! Taken at speed of light, not eternal moments in time! I need a vacation…. to go a place where i can toss my hair unfinishingly…KISSES on your hairs!! Whike on vacation for hair-tossing purposes …. take a dictionary with you for studying purposes:-). Quite frankly, at times it pains me to read your comments because of your many ill-chosen terms, Sometimes i can solve the riddle of what probably was intended as statement, sometimes i am simply at a loss. maybe less would be more – with better vocabulary. If you look at the last picture everyone is smiling something funny must have happened. Not every moment is gloom and doom. Amal is known in her field for and is good at her job. What she wears should have no effect on her job. She has always dressed nice and appropriate . Her clothes are expensive so what some of the people she reps are not poor. I don’t think anyone cares what she wears as long as she does her job. Nati , the red dress is Dolce&Gabbana . She carried the same bag even in Seri Lanka 👏🏻👏🏻 we have somthing in common . keep going Amal everyone deserve a fair trial . has anyone found a video link for this interview?? And again, any posts which comment on the repeated inappropriateness of Ms Clooney’s clothes do not get posted. This is a blog and different opinions should be valued. I am so fed up because of this, I will no longer go to this side. 35 posts for the last entry tell a lot. It is a ridiculously low amount and shows clearly that people started to refrain from commenting on this site because here is Nati at work Who will only accept comments of people who have a good opinion about your epitome. This blog does not have any value other than worshipping this woman who is just a clothes horse but nothing else. Good bye! It is a blog about different opinions but it is also a blog about Amal. Always judging people without to know them, it is quite unfair. Good bye ! Damm… it must feel so bad to not be able to vent 100% negativity everywhere heh Lara? Nadia, I would appreciate if you yourself could stop being so judgmental and negative about other people’s opinion. You are all over this blog hitting left and right. Take a breath and relax. Claudine, you must be a hater to defend them so much! No darling, i will be here as long as Nati allows me to, because the world needs good people and lovers so the haters wont take over. Remind you that there are more lovers than haters commenting on this blog, and so far, not one lover has come to bash my comments, only haters, whom you defend, do that. Interesting, dont you think? Life is to love and as long as i live i will make sure there will be a fair balance. If we are not here you will convert this blog into a Daily Mail maniac-vicious-ill-devious-dark-non-sense-mean blog. Why dont you go spent your time there and sucking in all that hate? I am sure you will feel wonderfull there because, for sure, i won’t be there:) . Nati, thank you for taking time out to maintain this blog. That being said, Nadia’s comments seem to be published with regularity. She spews the same level of negativity as those who comment unfavorably on Amal. It’s great to hear and read differing opinions, but Nadia’s commentary is often times does not add any new or relevant information. Again. Nadia. Take. a. breath. Relax. Nati, why do you allow Nadia to have a platform for her “negativity” that she espouses to be combating on behalf of Amal. In all fairness, if you are going to ban critiques of Amal, why not ban critiques of Nadia? My blog is not a battlefield against Amal or Nadia. The criticism must be constructive. On the internet, it is easy to criticize the others anonymously and I can see this daily. If people formulate their criticism in the right way, it is more likely that other people will accept it. Nati, exactly. Nadia’s often unintelligible (ie. Google-translate-esque) babbling often makes no sense; has no additive value or does she “formulate criticism in the right way.” But her comments always seem to make it on the blog. We all appreciate the time you take out to maintain this blog. We do. It would just be more interesting if you could be more selective in which of Nadia’s comments you would chose to post. Nati – completely agree that “if people formulate criticism in the right way” meaning making it thoughtful, constructive and educational…. people will listen. But, by your own definition, none of Nadia’s comments follow that line of thought? Why continue to allow her a soapbox for her (oftentimes) ramblings? Nadia’s posts for the most part are none of this and instead are just attacks on anything remotely critical of Amal and filled for the most part with inane and often hysterical babble. It’s a shame her voice is so loud on here. Perhaps we can each just skip right on over the posts that are not appealing, either by content or by author. I enjoy the array of comments, even the crazy and unintelligible, because the essence of Amal Clooney, as with all of us, lies somewhere in the middle. The crazy mean people are silly, and Nati’s one-liners and scoldings to the knuckleheads put them right back in their place, and make me laugh. Let’s hear them all, save the profane and inflammatory, and let the reader discern according to his or her own palate. After all, isn’t the freedom of expression the underpinning for which Amal Clooney appears to be fighting in her recent cases? Albeit an excessively-expensive, well-dressed Amal Clooney, which is quite often both ironic and preposterous considering the circumstances and venue of her appearances.